The 10/40 Window is the rectangular area of North Africa, the Middle East and Asia located between approximately 10 degrees and 40 degrees north latitude. 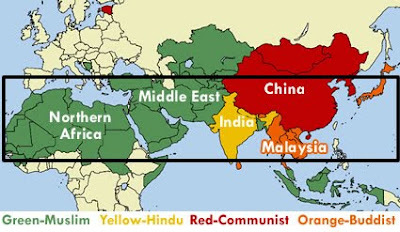 The 10/40 Window is often called "The Resistant Belt" and includes the majority of the world's Muslims, Hindus, and Buddhists. Around 4.43 billion people, representing over 8,700 distinct people groups live in this relatively small region of the world. It's not that people living in the 10-40 window are more valuable than those who live at other points on the globe. However, this part of the world has been especially resistant to the message of the Gospel. Not surprisingly, many of the countries within the 10-40 window are unattractive to missionaries, because they're dangerous places for Christians to live. That's especially true in Muslim nations like those in North Africa and Indonesia (shaded green above). Other countries (like Japan) are open to Christian missionaries, but mission works typically move ahead very slowly over many years. Of course, the Great Commission applies to the people of the 10-40 window just as to the rest of the world. It's not acceptable to neglect any part of the world as we move out with the glorious good news of the Gospel. When the apostle John wrote down his vision in The Revelation he described people from every tongue and tribe gathered around the throne in worship of the Lamb. That certainly includes people living in the Muslim, Hindu, and Buddhist nations of the 10-40 window. As we go out, we can go with the confident expectation that God has many people there. Our part is to go and proclaim the Good News. As we do so, we'll trust Him to provide lasting fruit. 1. Japan is of Strategic Importance - It's a first-world country with worldwide influence. 2. Christian Missions is "Legal" in Japan - unlike many of the Muslim nations within the 10-40 window, Japan welcomes Christian missionaries. This isn't meant to be construed as an argument against sending missionaries to dangerous countries where they face imprisonment or death. However, given the fact that Japan is a nation of 127 million people and less than 0.5 percent of those are Christian, it seems obvious that the Church would be sending many missionaries through the open door that exists there! FYI - the Japanese people are one of the largest, single unreached people groups on planet earth. 3. Japan is Ripe for the Gospel - Currently, the Japanese economy is in the midst of a recession that has lasted nearly 20 years. Japan has one of the highest suicide rates of all the industrialized nations of the world. Depression and disillusionment are at an all-time high. Old idols are failing to deliver on their promises to bless and protect worshipers. This is an excruciatingly hard place for a people to be, and we don't rejoice in their hardship. At the same time, the country's troubles also put the people in an unusually good position to hear the hope of the Gospel and receive the love of God through the person of Jesus Christ. 4. Missionaries all over Japan are Reporting New Interest in Christianity - I attended a church planting conference near Mt. Fuji in November 2009. While there, I made it my goal to speak with as many missionaries from different Christian traditions as possible. Every missionary that I spoke with told a similar story. Most had been in Japan for decades, and all reported that their work had been slow and difficult. However, every single missionary pointed out that over the past 1-2 years they had seen brand new interest in the Gospel - a level of interest they'd never seen before. I had the opportunity to lead 3 different Bible studies in Nagoya, and half the Japanese people at every study introduced themselves saying some version of this sentence: "Hello, my name is __________. I have been attending church for some time, but I am not a Christian yet (stress on yet). I have some questions about Christianity..." That's a sentence heard all too infrequently in the Southeast U.S.
5. Mission to the World is Positioned to Advance - The Nagoya team has been in place for over 20 years now. Over the course of that time, the church planting work has been painfully slow. However, there is now a healthy church (with two different congregations meeting for worship in the same building), an international Christian School, and a newly formed seminary is in place as a direct result of the team's work. (Some would argue that this isn't slow progress - even over a span of 20 years!) The team's vision is to work from this starting point and press out aggressively by planting new congregations in various places around the city. Gina and I have asked this question a lot over the past year! The current team has been doing an amazing job under the leadership of Wayne and Amy Newsome. However, in order to begin to plant multiple new congregations, additional team members are now needed. Men and women with various personalities and gifts will be important as MTW moves forward in Nagoya. One particular need is for additional ordained teaching elders (our denomination's title for a "pastor") to preach, administer the sacraments, and help develop Japanese elders at new sites. There is a need right now. Gina and I are ready to go and fill that need. There are many pastors in the U.S. who can take my place at Grace Fellowship, but few are in a position to go fill the need in Japan. Most importantly, we sense that the Spirit is calling us to go. Why us? We're not sure. Probably, because God delights to use the weak things of this world to accomplish his grand purposes! We're going because there's a need that we can fill, because the love of God compels us to go, and because we believe the Holy Spirit is sending us. Please pray for us! If you haven't had a chance to see our video presentation, you can do so here.